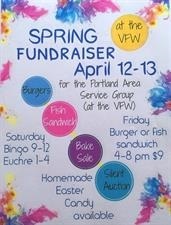 Portland Area Service Group (Senior Center) Annual Spring Fundraiser and Burger night all held at the VFW. Both days silent auction, bake sale and chocolate Easter candy. Friday April 12th from 4-8pm, Burger or Fish Sandwich basket.